Liz Allison chose not to go to the NASCAR Hall of Fame on Voting Day in May this year. Instead, she opted to watch on TV right along with other stock-car racing fans. 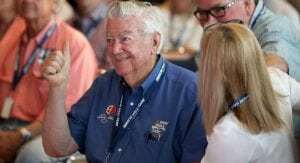 When NASCAR Chairman & CEO Brian France uttered Davey Allison’s name among this year’s five selections, the sense of relief took over as she fell to her knees and cried. Her late husband’s legacy will live on next winter upon his induction into the NASCAR Hall of Fame’s Class of 2019. For Liz, the recognition of Davey’s accomplishments stands as a special honor, but the lasting impact of having his memory endure in the sport’s shrine serves as an even greater comfort. “He will never be forgotten, and that’s been my biggest fear is that he would be forgotten, is that people wouldn’t remember him,” Liz Allison said. “They wouldn’t remember the driver that he was, the competitor that he was but the person that he was. They won’t remember. One of Liz Allison’s first phone calls went to her daughter, Krista Allison Sheinfeld, who described the emotions as “just pure joy.” For Krista and her brother Robbie, the announcement meant that two generations of Allisons would forever be linked in the Hall (their grandfather, Bobby, Davey’s father, was inducted as part of the Class of 2011).